At Jeffrey Scott Fine Jewelry we are jewelers with thirty (30) years extensive experience. We are proudly family owned and operated since inception. At Jeffrey Scott, you will always feel welcomed because the owners, Irene and Jeff Wolf, personally handle all your needs. We aim to make you feel welcomed and your business appreciated, in essence we want you to become a part of our Jeffrey Scott "family." In all of our years in business since 1989, we made it our business to know each and every customer's likes and dislikes, and we came to know our customers and their families. And often people would just stop in to say hello and visit, and see what was new. We have always endeavored and will continue to do so, to make our store a destination where people feel welcomed, and where "everyone knows your name." This type of personalized relationship is a dying breed in today's world of impersonal online or big chain shopping, or in stores where the customer deals with a parade of employees. From the smallest purchase to our most elaborate items, every single customer is important to us. And often customers in our store have said, you know, I am not your biggest customer by any means, but Jeff and Irene, you make me feel special and important every time I walk through the door. And each customer is invaluable to us. No high pressure sales tactics here, just good old fashioned service, top quality fine jewelry at everyday affordable prices, delivered in a lovely setting where you are treated as a member of the family. 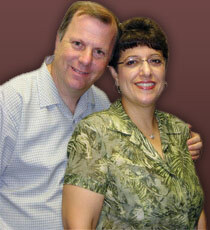 Come in and see us, we want to be your trusted family jeweler. Just like many of the by-gone traditions of locally owned shops from yesteryear, owners Jeff and Irene Wolf have brought these same core values to the greater Amherst, Bedford, Hollis, Milford, Merrimack, Nashua area. Surrounded by antique objects in the store that serve as reminders of how shopping for cherished diamonds, gemstones, and watches used to be, customers will step back in time to an unhurried atmosphere, where you can carry on a friendly chat, enjoy a 10 cent Coke, replace a watch battery, have a diamond setting repaired, or just browse amongst a large array of fine jewelry. You can get all that and more at Jeffrey Scott Fine Jewelry...today. 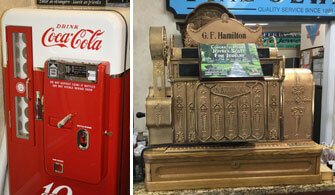 In keeping with our commitment to old fashioned quality and service, we have some eye catching restored antique vending machines on display in the store. Come in and see us, have a Coke in an old glass bottle for a dime from our fully restored 1950's soda machine, gum for a penny from our Ford gum machine or a candy bar from one of our 1950's candy machines, lovingly restored to better than new condition by Memory Lane Restorations of Maryland. Or come by to hear the "cah-ching" of our beautiful antique restored NCR (National Cash Register) brass register from 1907 or step on our antique floor scale. As you will see from the Jeffrey Scott custom designed logo for NH - with a moose fully decked out in jewels, Jeff and Irene have embraced NH and love it here. They had been coming to NH for at least ten years for pleasure and had long had friends in the area when they decided to move the store here in 2011. In fact, they loved it so much, that they had purchased a second home here in 2009. As you would expect, however, selling their home in NJ, uprooting their family, and closing a successful business after 22 years and moving to another state and starting fresh was a huge step they kept putting off. But their young son was what gave them their final impetus. They wanted a cleaner, "greener" and safer environment for their only child to grow up in, and for themselves, which NH provides in comparison to NJ. Their son is the apple of their eye, and has special needs, and the educational opportunities for him in NH also appeared to be greater. In NH they felt this was a place he would be included and fostered to reach his full potential, where his intelligence and abilities would be appreciated, a place where people would be more tolerant and accepting of people's differences, embodied in the State motto: Live Free or Die. Just as Jeff never regretted his brave switch to the jewelry business over 25 years ago, so too do Jeff and Irene feel in their hearts that in moving to NH they have truly come "home"- that NH is the right place for their family to be. They have come to know and love the state, stop in and let them come to know you as well, so you can become part of their Jeffrey Scott "family" - you won't be disappointed. Their door is always open. Even if you are not in the market for jewelry at the moment, come in and have a Coke, a piece of candy or gum at retro prices, or just to say hello. They would like to meet you and get to know you. Proud supporter of the National Rifle Association.